Hajo is the son of Max vom Türnleberg. Max has been the best producer of working dogs for the first decade of this century. Proof of this can be seen by looking at the number of Max offspring that have competed at the various German Rottweiler Club, SchH/VPG Championships. Max produced offspring with lots of heart and willingness to take the fight to the man. Hajo's mother is Tinka vom Hause Anin. 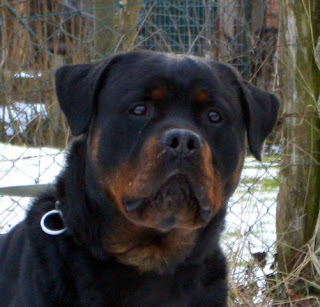 Tinka is a former winner of the German Rottweiler Club, SchH/VPG III Championship. This is an honour that is usually won by the best working male. Not only is Tinka a former winner but she is also the record holder for the highest score at an ADRK DM. Tinka was the ultimate sport dog. Hajo is an open, intense, confident, alpha male. He went V1 winning the working class at a Sieger Show under ADRK Judge Uwe Petermann. Hajo is at the upper end of the height standard. Hajo's pedigree is clear of Rick von Burgthann.